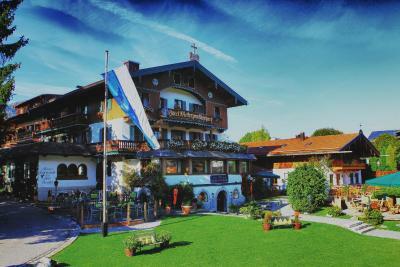 Lock in a great price for Hotel Maier zum Kirschner – rated 9 by recent guests! Very central location. Great breakfast and spacious comfy rooms. The Owners, Familie Maier and their whole team are wonderful. The rooms are very clean and in perfect condition. We traveling with our pet and they where very welcoming to us. The food is incredible which includes breakfast, the lunch and the dinner. We can really highly recommend this hotel. Das Zimmer hatte Charme. Die Lage ist perfekt. Das Frühstück war lecker. Ich kenne das Hotel von früher. War regelmäßig Gast. Immer sehr zufrieden. Das ist aber schon 8 Jahre her. Das Hotel hat sich keinesfalls verschlechtert. Immer empfehlenswert. Das Hotel hat eine tolle Lage , direkt am See und im Zentrum ! Die Zimmer sind sehr gemütlich eingerichtet ! Und das Frühstücksbuffet war sehr lecker , das Küchenpersonal erfüllte einem jeden Wunsch ! Die Lage war toll, auch von der Anbindung. Sowohl mit der Fähre als auch dem Bus schnell zu erreichen. Das Frühstück war sehr üppig und für jeden Geschmack etwas dabei. Die Teesorten-Auswahl fand ich besonders beeindruckend. Das Personal war sehr bemüht die Wünsche der Gäste zu erfüllen. Das Zimmer war sehr sauber und großzügig geschnitten. Schön fand ich die Möglichkeit den Spa-Bereich mit dem Fahrstuhl zu erreichen. Im Saunabereich gab es Getränke und kleine Naschmöglichkeiten. Sehr schöne Idee! Hotel Maier zum Kirschner This rating is a reflection of how the property compares to the industry standard when it comes to price, facilities and services available. It's based on a self-evaluation by the property. Use this rating to help choose your stay! Featuring a wellness center and boasting views of the Tegernsee Lake, family-run Hotel Maier zum Kirschner offers accommodations in Rottach-Egern, in the Bavarian Region. Free WiFi is provided and free parking on-site is available. All nonsmoking rooms and suites at Hotel Maier zum Kirschner offer wooden furnishings, a mini-bar, a flat-screen TV, a safe and a balcony or terrace with views of the garden, mountains or Tegernsee Lake. The bathroom comes with a bathtub or shower, hairdryer, slippers, bathrobe and free toiletries. A rich breakfast is provided every day and in summer guests can enjoy it on the sunny terrace with lake views. In the evening guests can have dinner in the two on-site restaurants. Die Kirschner Stuben à la carte restaurant serves Bavarian cuisine and international dishes, while Enothek am See restaurant serves innovative cuisine and offers a wine cellar, where guests can taste Italian, Austrian, South African and German wines. Hotel Maier zum Kirschner offers conference and function rooms for wedding and birthday celebrations. These rooms have lake views and a Bavarian ambiance. The hotel's spa center includes a sauna, an outdoor pool, a whirlpool, steam room and an infrared cabin. A variety of massages and beauty treatments can be booked in advance. The spa is included in the room rate. E-bike hire is available on-site. This area is popular for hiking, cycling and horse riding, as the property offers its own riding facility Kirschen Alm with horse riding courses. Munich center can be reached in one hour by car. Austrian border is 14 mi away from Hotel Maier zum Kirschner. When would you like to stay at Hotel Maier zum Kirschner? This single room features a single bed, a mini-bar, safe and a balcony offering mountain views. The bathroom comes with bathtub or shower, bathrobe, slippers, hairdryer and free toiletries. This single room features a large double bed, a balcony and mini-bar. The bathroom comes with a bathtub or shower, bathrobe, slippers and free toiletries. This double room features a cable TV, mini-bar and bathrobe. The bathroom comes with a bathtub or shower, bathrobe, slippers and free toiletries. This double room has a balcony, mini-bar and cable TV. The bathroom comes with a bathtub or shower, bathrobe, slippers and free toiletries. This large double room features an extra large double bed, a safe, a mini-bar, a mini-bar and a flat-screen TV. The bathroom comes with a bathtub or shower, bathrobe, slippers and free toiletries. This studio features a balcony, bathrobe and cable TV. The bathroom comes with bathtub or shower, bathrobe, slippers and free toiletries. This studio has a balcony, mini-bar and bathrobe. This deluxe studio offers lake views, a safe, mini-bar and flat-screen TV. The bathroom comes with a hairdryer, bathrobe, slippers and free toiletries. This suite features a bedroom, living area, mini-bar, safe, kitchen and terrace. The bathroom comes with a shower or bathtub, bathrobes, slippers and free toiletries. This suite features a bedroom, living area, mini-bar, safe, flat-screen TV. The bathroom comes with a shower, bathrobes, slippers and free toiletries. It offers lake views. This suite features a bedroom, living room, kitchen, mini-bar and safe. The bathroom comes with a shower or bathtub, bathrobes, slippers and free toiletries. It comes with a balcony offering mountain views. House Rules Hotel Maier zum Kirschner takes special requests – add in the next step! Hotel Maier zum Kirschner accepts these cards and reserves the right to temporarily hold an amount prior to arrival. The expensive but tasty bistro is not part of the hotel although it’s onsite. This means you are unable to charge to your room which was not explained to us beforehand.